Every time we see a Great Blue Heron, Coleman always says, "Look, there's a flamingo." I guess they do look alike, except for the color. I suppose I can't talk. 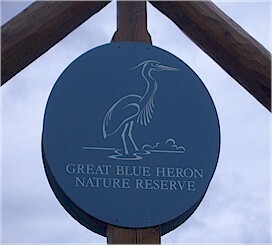 My whole life, I've always called Great Blue Herons, "Egrets." I've since learned that Egret is the name given to any herons bearing long plumes during the breeding season. If I've piqued your interest about herons, you can see plenty of them at the Great Blue Heron Nature Reserve in Chilliwack.